Cosmic Cat Classic Slot Guide & Review - Casino Answers! Cosmic Cat is a 3-reel, 1-line classic slot machine with a wild symbol. You can play the Comic Cat slot machine at any Microgaming online casino, including All Slots Casino and Virtual City Casino. Cosmic Cat is a sci-fi themed video slot featuring a cat and a mouse in space. It’s a very cute theme that animal lovers (cat lovers in particular) will enjoy. Symbols in Cosmic Cat include a cat, a mouse and bar symbols. There are eight winning combinations in Cosmic Cat, not including combinations completed by wild symbols. To play the Cosmic Cat slot machine, you must first choose your coin value to wager. Bets start at $0.25 and also include $0.50, $1, $2, $5, $10, $20 and $25. You can bet one or two coins per spin, making the maximum bet on Cosmic Cat $50 per spin – a large maximum bet for a classic slot machine. There is no extra value in betting 2 coins. To play both coins, you can use the “Bet Max” button. To play whatever you have set up, spin the reels using the “Spin” button. When you spin the reels, a Star Trek type of sound effect will play. The top jackpot on the Cosmic Cat slot machine is the cat. On a 2-coin bet, three cat symbols will be worth 1000 coins. The cat symbol is Cosmic Cat’s wild symbol and can substitute for any symbol in the game to complete a winning combination. The mouse symbol is the next best thing at 200 coins. 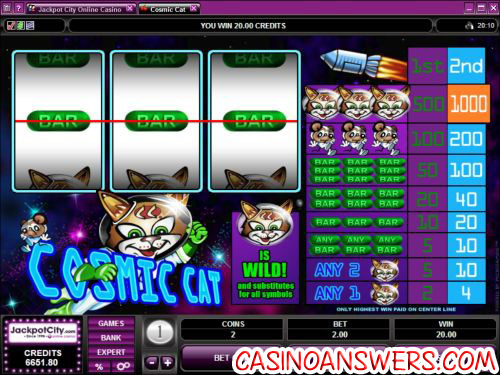 Payouts on the Cosmic Cat slot machine are (1/2 coin payouts in parenthesis): 1 cat symbol (2/4), 2 cat symbols or 3 of any bar symbols (5/10), 3 single bar symbols (10/20), 3 double bar symbols (20/40), 3 triple bar symbols (50/100), 3 mouse symbols (100/200), 3 cat symbols (500/1000). Only the highest win on the center payline will be paid out. Hit the Expert button and you will enable Cosmic Cat’s autoplay mode. Settings include the number of spins (5, 10, 25, 50, 100, 250 or 500), number of seconds between spins (0, 0.25, 0.50, 0.80 or 1.50), to stop once all spins are complete (default), to stop when the jackpot is won, to stop if any win exceeds or equals your selected amount ($25, $50, $100, $250, $500, $1000 or $2500), to stop on any win you receive and to stop if your credits increase/decrease by your selected amount ($25, $50, $100, $250, $500, $1000 or $2500). If you’re looking for a great bonus you can use on Cosmic Cat and other great Microgaming slot machines, you can get a 100% up to $200 first deposit bonus plus 10% reload bonuses, totalling to a $5000 signup bonus at All Slots Casino. Can the Cosmic Cat classic slot be found at any US-friendly casinos? Cosmic Cat is exclusive to Microgaming online casinos and none of them are accepting US players at this time. You can find several excellent classic slot machines at US-friendly RTG casinos such as Winpalace Casino. Do I need to download any software to play Cosmic Cat? All Slots Casino offers a no-download Flash casino in addition to the download version. If you have any problems playing the Cosmic Cat Flash game in your browser, make sure you have the latest version of Adobe Flash Player installed on your computer. What space theme based slot machine games are there? What is a simple slot machine to play? What is a nice basic slot machine game? What are the payouts for Cosmic Cat?